On Friday, December 7th, Mark Kirwin, founder of KIRF and member of the Rotary Club of Ventura, with Steve Doll, who is also a member of the Rotary Club of Ventura, traveled to New York city to help the on-going Hurricane Sandy relief efforts. After landing at JFK, they met up with KIRF board member Patrick Rea, a resident of New York. 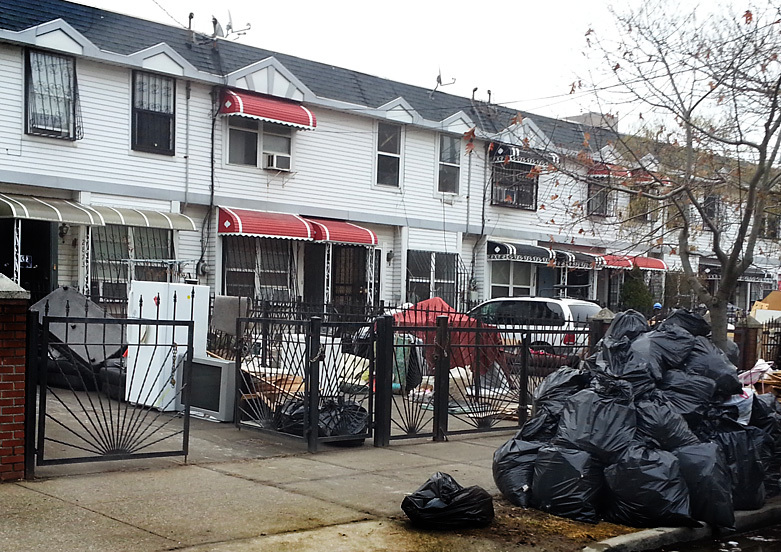 Patrick had been doing on-the-ground assessments of post-Hurricane Sandy relief needs was ready to help. That Friday night we visited several shelters in Brooklyn and found out that they were no longer providing aid to Hurricane Sandy victims. The people at the shelters suggested that we travel to the hardest hit areas: Staten Island, the Rockaways, and Coney Island–areas where there was still a lot of need. According to the New York Times, most of the flooding and deaths from Hurricane Sandy occurred in these areas. Of the people who died from Hurricane Sandy in New York City, 34 of the 43 deaths were elderly residents on Staten Island. On Saturday morning we met with local volunteer relief workers at the area’s Occupy Sandy headquarters. Occupy Sandy is a New York City-based disaster relief group of local citizens, humanitarians and tech-savvy volunteers that has been quick to to deliver relief supplies directly to Hurricane Sandy victims. When we arrived we saw a logistically well-organized relief effort being run by an Occupy Sandy volunteer group headed by a relief worker named Kelly. From what we understood, the Occupy Sandy group had volunteers working in different neighborhoods of the region’s storm ravaged areas. These volunteers worked with local resident councils who advised them on their most pressing needs. The councils then distributed the provided aid to their residents who made the requests. 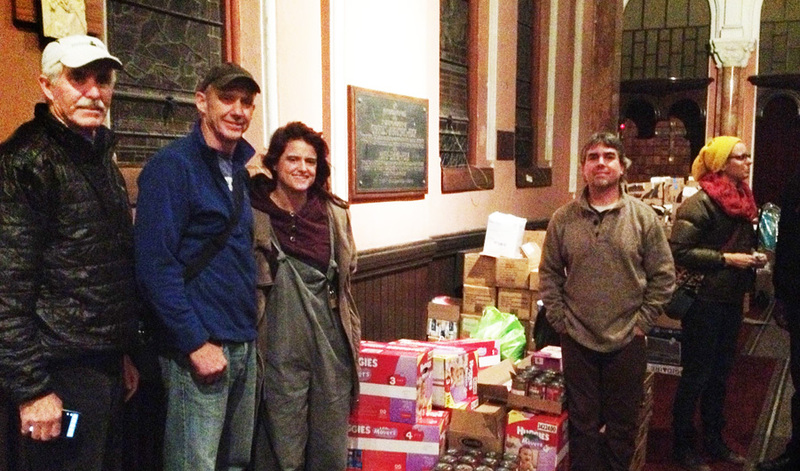 Many thanks goes to the Church of St. Luke and St. Matthew for their incredible kindness in offering the Occupy Sandy group a safe and secure place from which to direct their volunteer disaster relief. We purchased relief supplies that were requested by the resident councils of two areas devastated by extensive flooding: the low-income housing complex of Ocean Towers on Coney Island and the Red Hook neighborhood in Brooklyn. After purchasing the relief supplies for the Ocean Towers complex, we delivered them directly to their resident council. The supplies they requested included baby food, diapers, and wipes, toiletries such as shampoo, toothpaste, toothbrushes and feminine sanitary products, and cleaning supplies: mops, construction gloves, sponges, garbage cans, construction garbage bags, bleach (for cleaning the mold from the water surge); and school supplies such as pencils, crayons and lined paper. And, we purchased non-perishable food items that were requested such as canned soups, tuna fish, and stews. We then purchased and delivered similar items requested by the resident council of the flood damaged Red Hook neighborhood with the assistance of Occupy Sandy relief workers. There are piles of ruined furniture and garbage from cleaning out water-damaged homes lining the streets in the coastal neighborhoods we visited. It still amazes me as to how much aid is still needed even five weeks after a major disaster, especially for low income families with children and the elderly, in a major American city like New York. A special thanks goes to the Rotary Club of Ventura who partnered with KIRF to provide the funds to purchase the aid for this disaster relief effort. We also thank the manager of the Brooklyn Path Mark grocery store who gave us a discount when we purchased relief supplies. Our relief effort would not of been possible without the tireless efforts of the people of Occupy Sandy, including Kelly, Lev and the rest of the volunteers. These people made the efficient distribution of aid possible from the private sector. Five weeks after the disaster, they continue to get aid to families still suffering from the devastation of Hurricane Sandy. And, last but not least, I thank Steve and Patrick for volunteering their time and joining me in this effort.